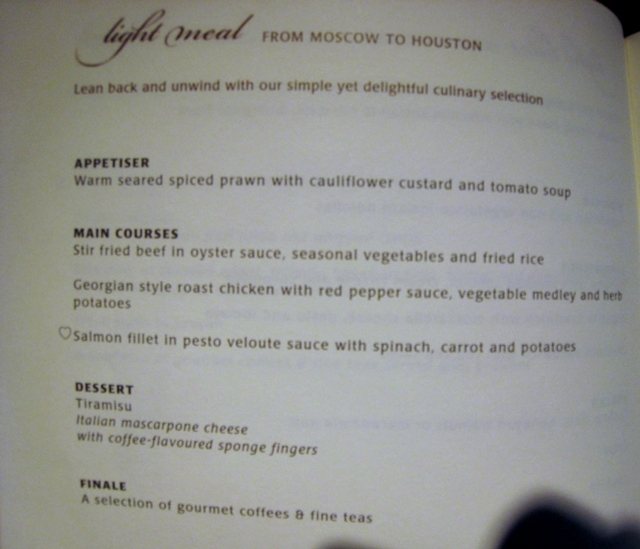 This Singapore First Class Review is part of a trip report including First Class and Business Class to Moscow on Lufthansa and Singapore Airlines, with reviews of luxury hotels and dining in Moscow and St. Petersburg, Russia. I arrived at Domodedovo Airport without a lot of time to spare, having missed the Aeroexpress train I wanted to take and taken a local train. There was no line at check in, although I did discover a gaggle of trainees who were learning how to check folks in and issue boarding passes. Fortunately that didn't take long, and security and passport control were expedited for first and business class. I just had time to snap a photo of the rather ordinary business class lounge Singapore uses in Domodedovo before proceeding to the gate and boarding. Even though this was Singapore's “old” product and not a Suite, the lack of other passengers on my flight made it a very private experience. 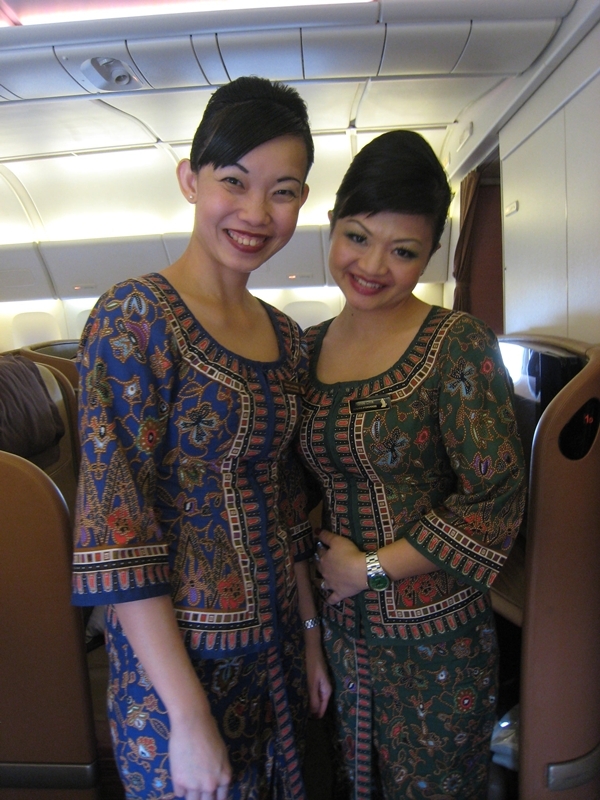 The male flight attendant served the male passenger in 1A, and the friendly and personable female flight attendant served me. Can't really ask for better than a 1:1 staff to passenger ratio! I was offered my choice of Dom, Krug or other preflight beverage, but opted for water. It's easy to not get enough water when traveling, especially in the dry winter months. Pajamas, slippers, socks and an amenity kit were also presented. 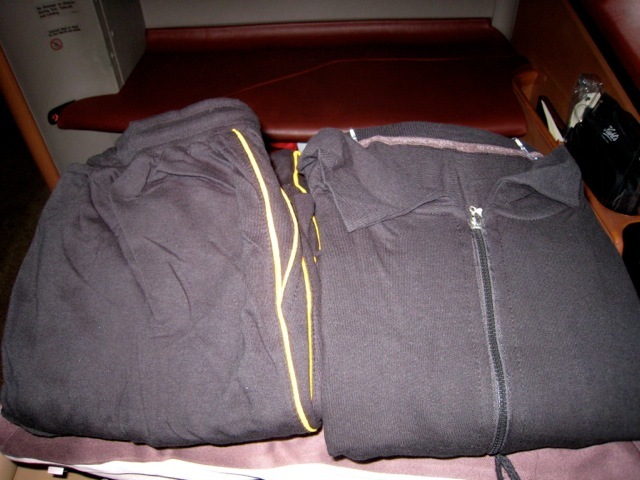 Singapore's pajamas are made by Givenchy and are black with yellow accents. I found the pants to be a bit short in the leg, but otherwise they fit well. 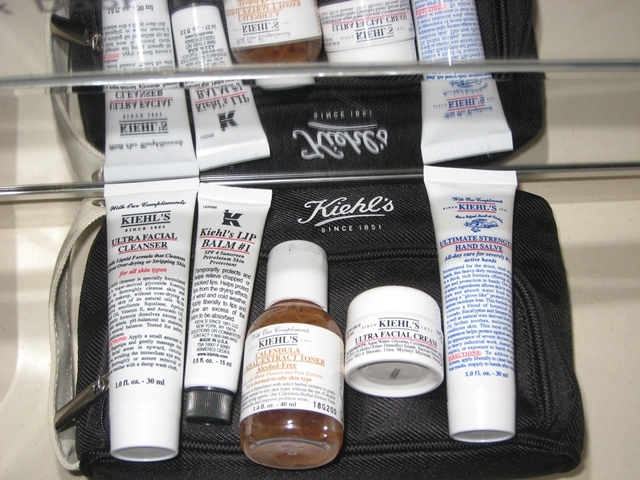 I especially liked the Kiehl's products in the amenity kit, which includied facial cleanser, lip balm, calendula toner, ultra facial cream, and hand salve. 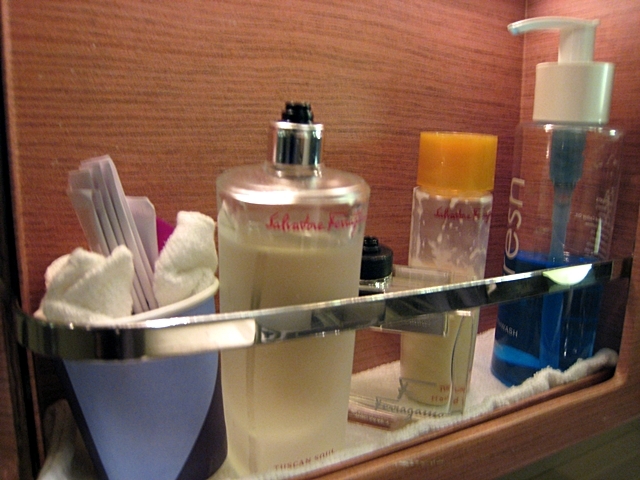 At first I thought it strange that there weren't more ordinary but essential items such as a toothbrush and toothpaste, but later discovered them in a drawer in the bathroom. 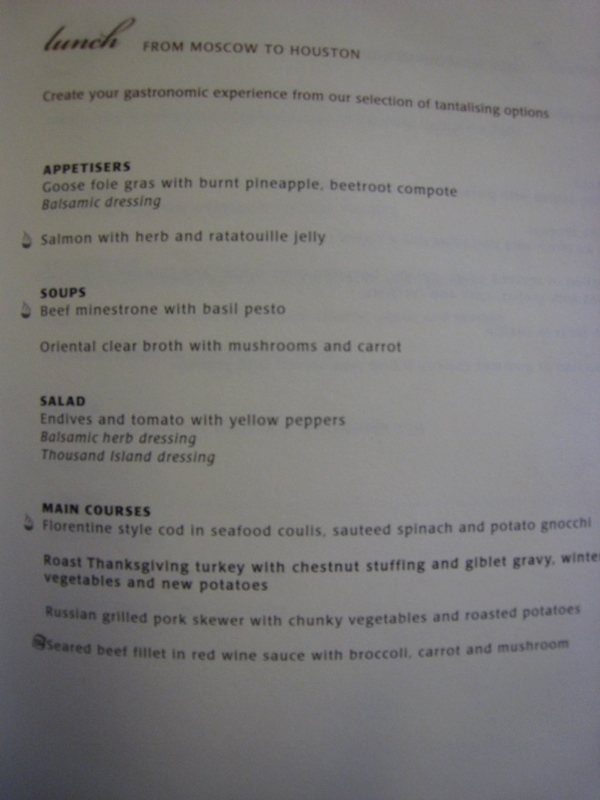 The lunch menu wasn't Singaporean at all, which I was a bit disappointed by, but did nod to the U.S. Thanksgiving Day holiday by including a choice of turkey with chestnut stuffing. 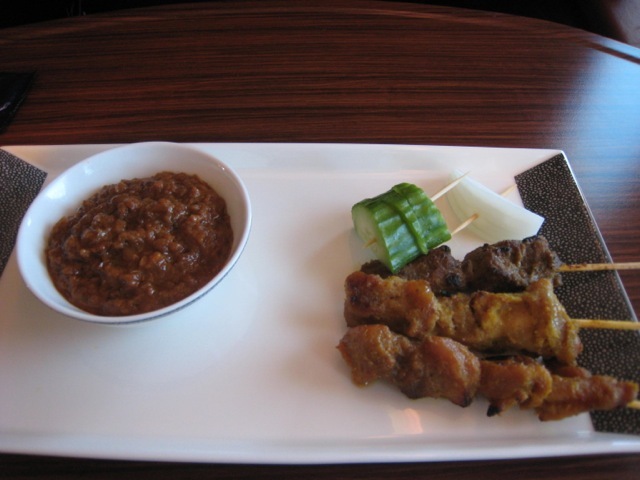 I was famished, not having really eaten breakfast, so was doubly delighted when a pre-meal dish of satay with peanut sauce was brought out. It may not have been as good as satay I've had in Singapore and Bali, but it's one of the best homestyle appetizers I've ever had on a flight. 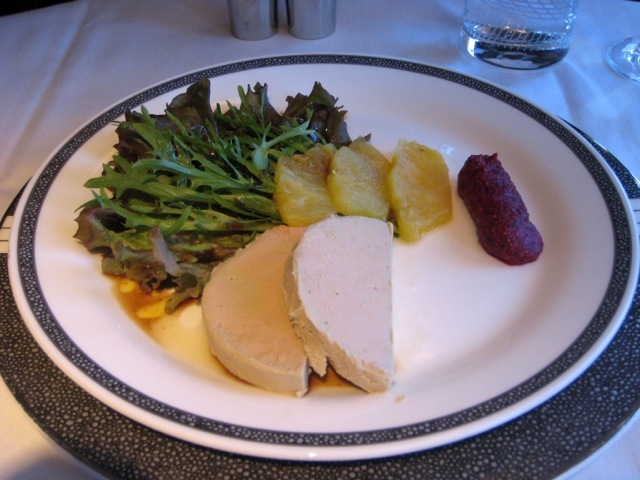 From the menu, I chose the Goose foie gras with burnt pineapple and beetroot compote. I don't think I've ever had those accompaniments to foie gras before, but they worked pretty well and this dish was as good as it looked. To accompany, I had a taste of Dom Perignon. I'm not a big fan of champagne, but in the absence of a good sauternes or ice wine, champagne seemed the best choice to go with the foie gras. 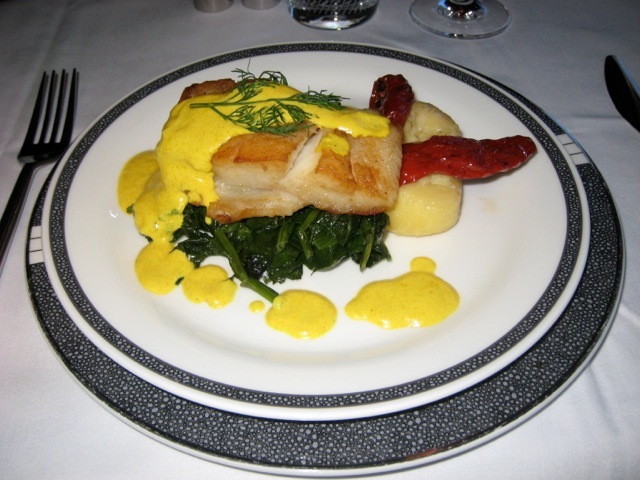 I opted out of soup and salad and instead followed with a main course of Florentine style cod in seafood coulis, sauteed spinach and potato gnocchi. 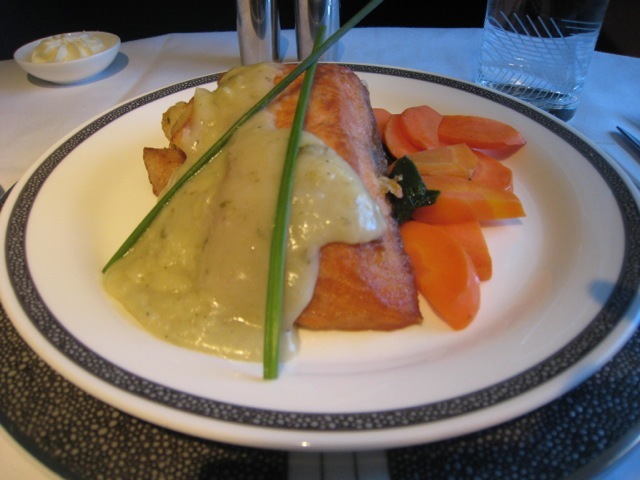 This was quite good for flight food, although I usually tend to shy away from fish when it comes to flights–it's hard to get it anywhere near restaurant quality, given the nature of premade flight dishes and reheating. Still, I didn't feel like following a rich appetizer with a heavy meat course. The dessert was pistachio creme brulee (no choice of dessert) with cherry sauce. I was wondering how they'd tackle the brulee part, but they didn't even attempt it; it should have been called pistachio cream or pudding, because the top wasn't bruleed at all. 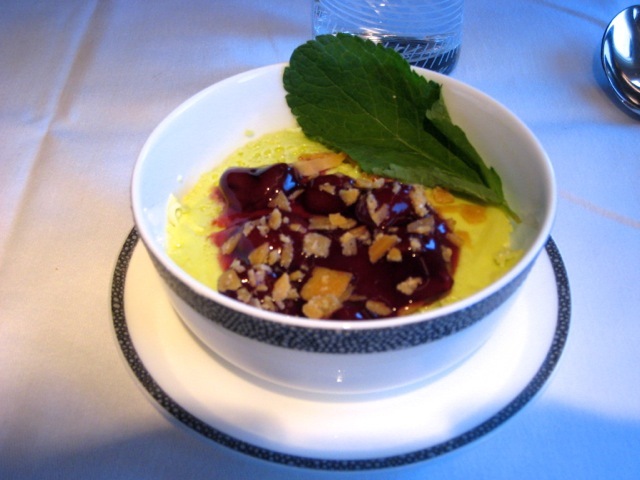 The taste was good, and as puddings go one of the better I've eaten in-flight and well complemented by the cherry sauce and almond flecks, but a bit of a misnomer. I didn't expect to necessarily sleep, since I often have trouble sleeping in even first class fully flat beds due to the padding not being as comfortable as my bed at home, but I can honestly say that I had the best solid sleep ever in this Singapore First Class bed. My caveat is that I had gotten so little sleep the night before that I was dead tired, but I still have to give some credit to the bed. 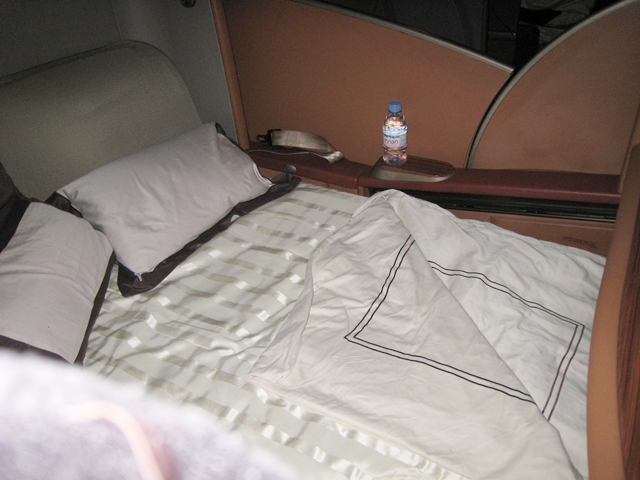 Being completely objective, I do think it's a bit firm for my taste, probably even more so than Cathay Pacific, although some folks prefer firm beds anyway. The salmon was a bit dry, so I can't really give full marks to it, although I'm probably about as much at fault for ordering fish again. Trying to eat (a little) more lightly! 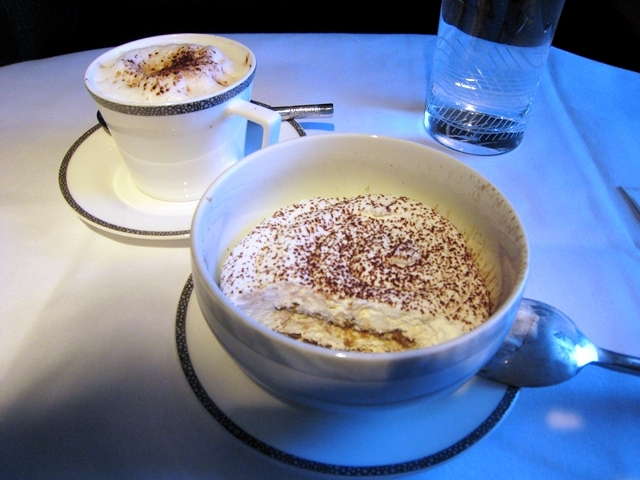 The tiramisu is again not one of my favorite desserts, but it was a very decent rendition and good when paired with a cappuccino. It's a pretty nice treat to have a delicious foamy cappuccino in the sky. 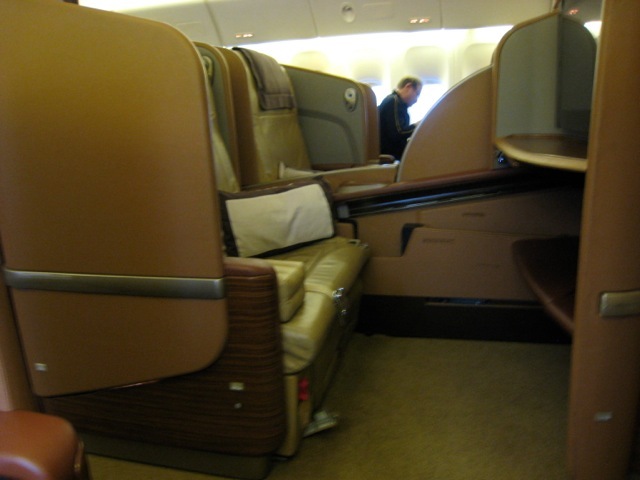 The Verdict: The things I enjoyed most about my Singapore First Class flight were the personable service, great sleep and privacy, although I rather lucked out having only one other passenger in first class. 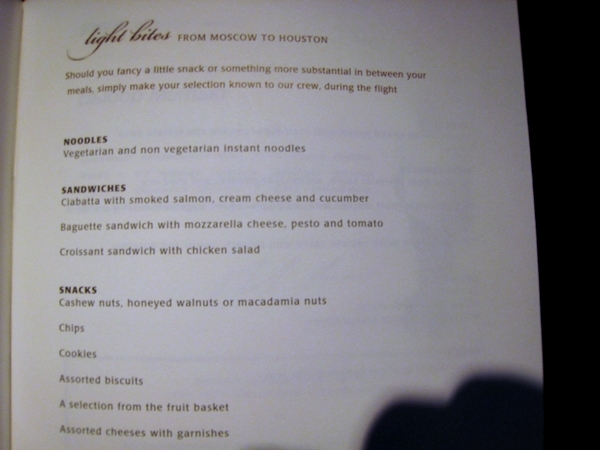 The food was a bit hit and miss–I really enjoyed the satay, foie gras and cappuccino, but less so the fish dishes. Soup and desserts were fine, though not special. 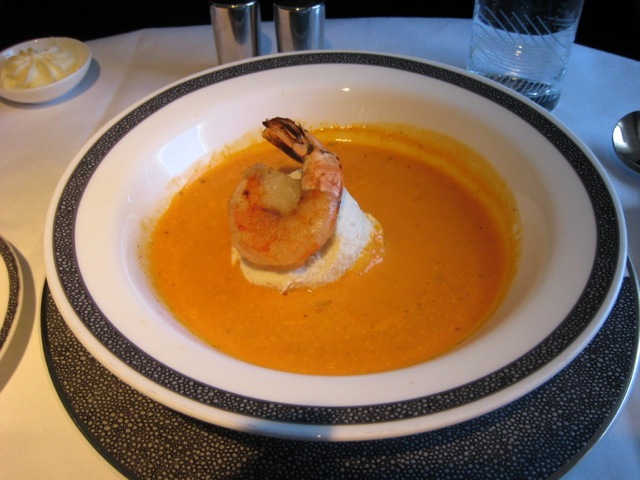 That said, I'm betting catering is better on flights from and within Asia, as I had the best business class food ever in Singapore Business class. 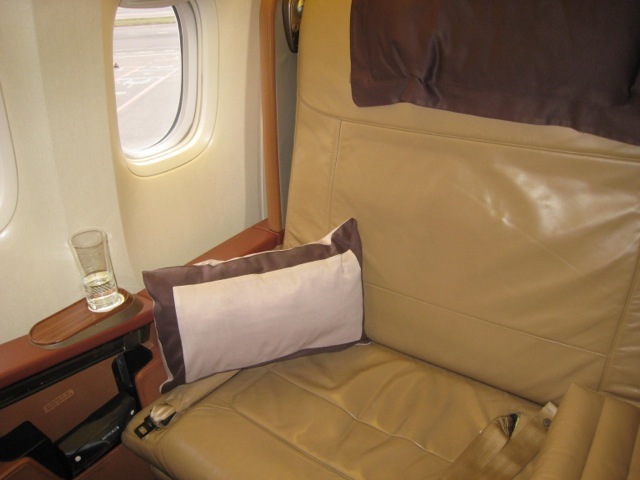 If you've flown Singapore First Class, what was your experience? 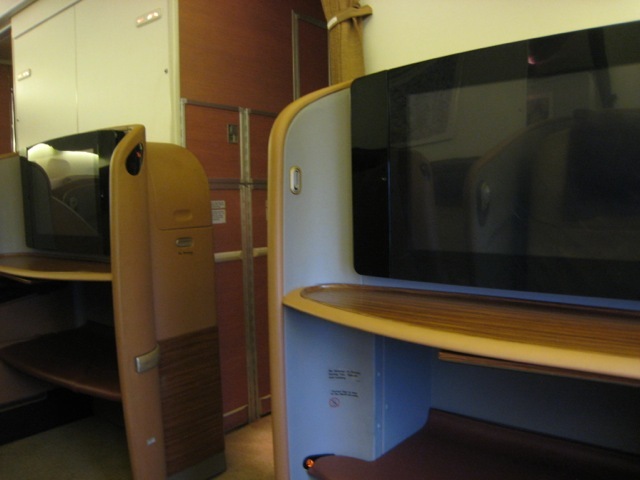 Singapore Airlines' New Saver Awards: First and Business Class for Star Alliance Partners?